Any lost valuables in yards, parks, old home sites, ball fields, or beaches in and around the Savannah area. I work on a reward basis. That means you pay what you can afford, and what it is worth to you to have me come out and find your lost item. There will be a call out fee of $25 to cover gas if the item is not found. Any jewelry, rings, keys, watches, cell phones, or lost family heirlooms... Land searches only at this time. Hi, I'm Tom. 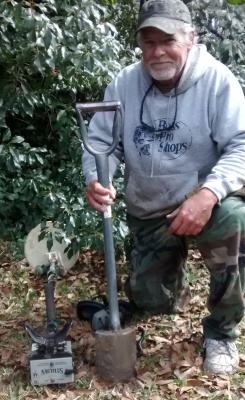 I have been metal detecting for over 35 years. Using my experience and top of the line detecting equipment, I will find objects that you, a family member, or a friend have lost. Even if you are just curious to see what is buried on your property, then give me a call, I would like the chance to help you out. Personal Treasure Related Websites: Coastal Empire History Hunters Assoc. CEHHA. We have also published a book, Relics Of The Coastal Empire, available on our site.